Municipal mailing address: PO Box 197, Kempton PA 19529; 610-756-6452. Photo: Daniel Boone birthplace (Bertolet Cabin), ca. 1735, Albany Township, Berks County, PA. Listed on the National Register of Historic Places in 1972. Photographed by User:Connor Kurtz, (own work), 2007 [cc0-by-1.0 (creativecommons.org/publicdomain/zero/1.0/deed.en], via Wikimedia Commons, accessed May, 2015. 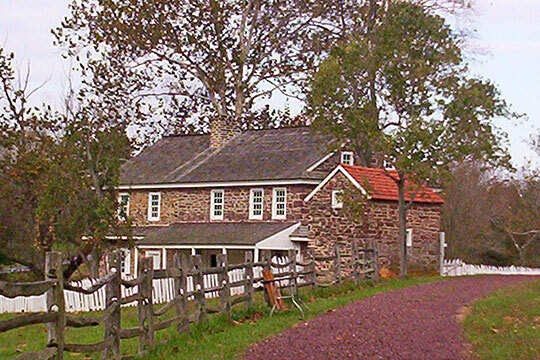 First settled around 1743, Albany Township was incorporated in 1752. The name Albany signifies "all wants," a term given to it by the Indians because they considered it poor soil. Soon after its erection it was divided into two districts by a straight line running east and west. The northern part retained the name Albany, and the southern part was named Greenwich. Both townships were named after districts in England. The first settlers were Germans who came north along the Maidencreek and made their homes here about 1700. They moved into that section of Albany called "The Corner," now Eckville. Here Cornelius Frees erected a log building. This was the first building in the township and occupied a dangerous position during the Indian invasions, when it was a fort. In this township is the "Pinnacle," a spur extending out from the Blue Mountains, and rising to a height of 1,670 feet. This is the highest point in Berks County. Daniel Berk Log House, circa 1760; the original home was passed on from the first Daniel to his son, Daniel (1796-1871) and on through five generations. Brobst Grist Mill, circa 1786, was part of a larger industrial site which included large land tracts. Schaumboch's Tavern, circa 1793, was built along an old Indian trail on a mountainside. Trexler Historic District, 1790-1930; the village of Trexler was founded in 1863 when Nathan Trexler purchased an existing tannery and moved his own operations to the site.